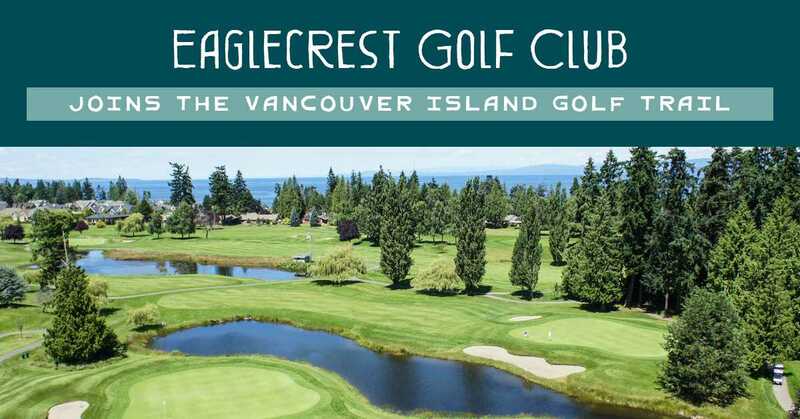 Home » Eaglecrest Golf Club Joins the Vancouver Island Golf Trail! Eaglecrest Golf Club Joins the Vancouver Island Golf Trail! Posted January 17th, 2019 by golfvi & filed under Parksville Qualicum Beach & Nanaimo Golf, Vancouver Island Golf Trail Blog. Golf Vancouver Island is pleased to welcome Eaglecrest Golf Club to the Vancouver Island Golf Trail! As one of the oldest golf courses on Vancouver Island, Eaglecrest has a long and storied history, from its beginnings as a country lodge on 260 acres in the 1930s (complete with putting green), to a resort in 1960 and a 9-hole golf course in 1971. In 1990 it became the first 18-hole golf course in the area. Today Eaglecrest Golf Club, perched within a tee shot of the shores of Qualicum Beach, provides golfers with a uniquely challenging course that winds through dense groves of firs and cedars, with a par-5 14th hole bordered by lakes and a pot bunker guarding the green. Better bring your “A” game on your next golf trip to ensure success! As for the region, Parksville-Qualicum Beach is an ideal golf destination. Off the green, explore seemingly endless beaches, trails, spas, and incredible food, just to name a few. Relax and enjoy the region, where you can immerse yourself in nature or find ample entertainment, depending on your preference. Read more about relaxing while enjoying your golf vacation in Parksville-Qualicum Beach. What are you waiting for? Enjoy Vancouver Island’s “best-kept secret” in beautiful Qualicum Beach. Discover Eaglecrest Golf Club & book your golf vacation today to explore the top Vancouver Island golf courses.